Here we are in the end of February and the Bulldogs are watching from the outside as teams jockey for top spots and make plans for postseason trips. It wasn't supposed to play out like this, but here it is. A once promising season has turned into being left playing possible spoiler. And this weekend may prove to be the greatest challenge. Saint Cloud comes in on a tear and any points stolen by UMD this weekend will be because of stellar defense coupled with offense. Can it all come together? Picks by @afiskness. With the 2015-2016 season nearing the end the Bulldogs are looking to remain in the hunt for home ice in the playoffs and spoiler. The next few weeks will be difficult for the Bulldogs playing two strong teams. There strong defense and goal tending should keep the Bulldogs in these games, now if they can score a few goals maybe they can get a win. 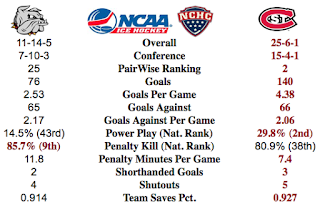 Colorado College @ #RV Miami: The Redhawks are having a strong second half of the season and should be able to pull out a sweep hosting the Tigers. #8 Denver @ Western Michigan: The Pioneers have really turned it on the second half of the season. The Broncos remain inconsistent and even the home ice won't prevent them from being swept this weekend by the Pioneers. #4 North Dakota @ #13 Nebraska Omaha: The Mavericks second half of the season has been difficult, but they always get up for the Fighting Hawks. This looks like it will be a split. Minnesota Duluth @ #3 St. Cloud State: The Bulldog's good defense but low scoring offense travels to St. Cloud and should help the Huskies remain in pole position for the Julie and Spencer Penrose Memorial Cup. Huskies sweep. Bulldogs Sweep Drought is at Two Months, Relief this Weekend? Over and over Bulldog fans have been hearing how important the games are. Every weekend seems to be "the last stand" for UMD and their chances for home ice in the NCHC playoffs, NCAA playoffs, and to live up to expectations of this talented team. And over and over, the struggles for UMD trump the efforts. Some say UMD can't score "enough", but when they do, the defense sags. When the defense is tops, offense sags. Early leads vaporize, late leads don't feel safe. Baffling season. But here it is again, the chance to right the ship with a 110% effort when backs are against the wall in this must-have weekend. Check. Picks by @afiskness. This weekends series against the Tigers is likely to be one that Bulldog fans will point back to no matter the outcome. A sweep will really help UMD stay in the race for home ice in the playoffs. A split or a couple ties won't change the standings much and being swept will likely keep UMD in the bottom half of the standings at the end of the year. 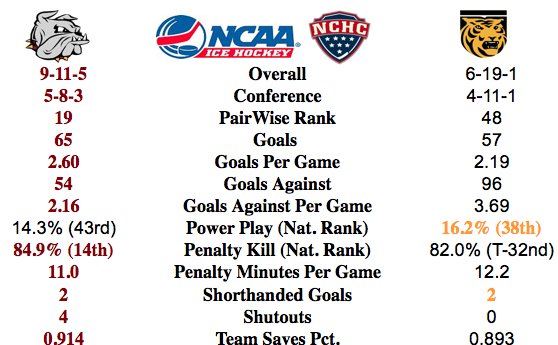 My concern is the lack of scoring will continue and UMD will fall to seven or eight in the NCHC standings. Not a good place to be this or any year. What seems crazy with the remaining schedule I think if UMD won six of the next nine games they will be a top 15 team in the pairwise when the playoffs start even though they currently have only won nine games. PWR #2 St. Cloud State @ #22 Miami: The Huskies are currently finding it pretty easy to put the puck in the back of the net, but the improved play by the Redhawks will help them get a split at home. 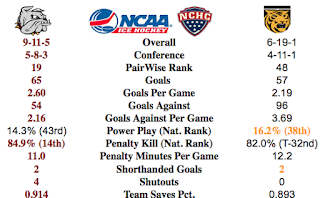 PWR #48 Colorado College @ #19 Minnesota Duluth: The Bulldogs are having significant difficulties scoring this season, playing the Tigers may be a good short term cure. 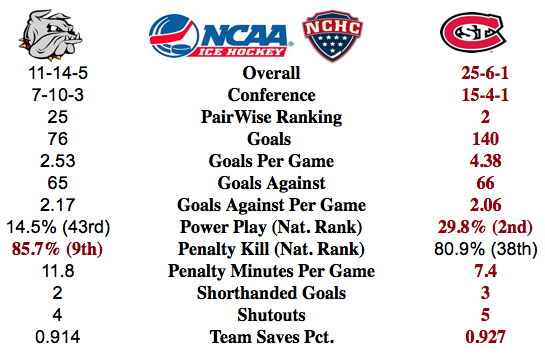 I think UMD will play strong enough defense and score enough goals in one of the two games to get a split. PWR #34 Bemidji State @ #19 Minnesota Duluth: This is the make up game for the power outage at the beginning of the season. I don't like the match up for the Bulldogs who have not played well at AMSOil Arena. I will pick a Beavers win.